I save recipes to my computer all the time. I have hundreds and hundreds of recipes. Every once in a while I go through the various folders and see recipes I want to try. I might even put the recipe on my desktop so it is in my face and on my mind . . . in hopes that I will actually try it. Sometimes I do. Sometimes I don’t. I had found a recipe the blogger called flatbread and it sounded delicious so I saved it to my desktop. 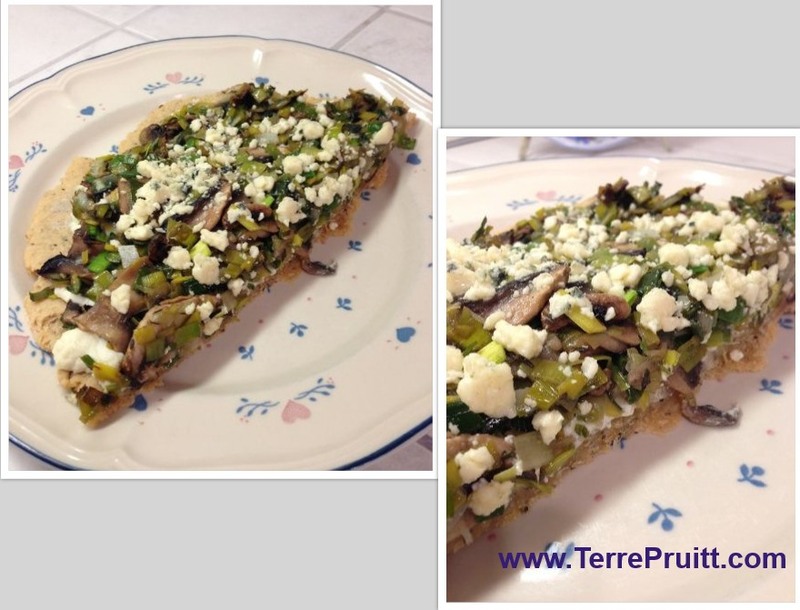 While I was at the store I remembered I had a leek in the refrigerator and I thought mushrooms and leeks on top of the flat bread would be good. I couldn’t remember what the recipe called for, so I bought the mushrooms. Here is what I ended up doing. It was good. The toppings of leeks and mushrooms gave it a lot of flavor. However, I just need salt in my food otherwise it is bland. So even with the toppings having sufficient amount of salt the bread was too bland for me. I am sure for regular people who don’t require so much salt it would be fine. My hubby loved it. It also didn’t taste nor have the texture of the flat bread I am used to. It was more like a biscuit. Or a shortbread. That is probably due to the baking powder. OR it could have been due to the fact that I read 1/2 cup olive oil and the recipe called for 1/3 cup. Anyway, since my husband loved it, I will be doing it again. My toppings will probably change. And I will definitely add salt to the dough! And I might even try it with the less oil. I have noted the changes I will make next time in italics. After washing the leek, chop the leek into small pieces. After washing the mushrooms, slice them. Heat the coconut oil. Add the leeks to the pan and cook them. 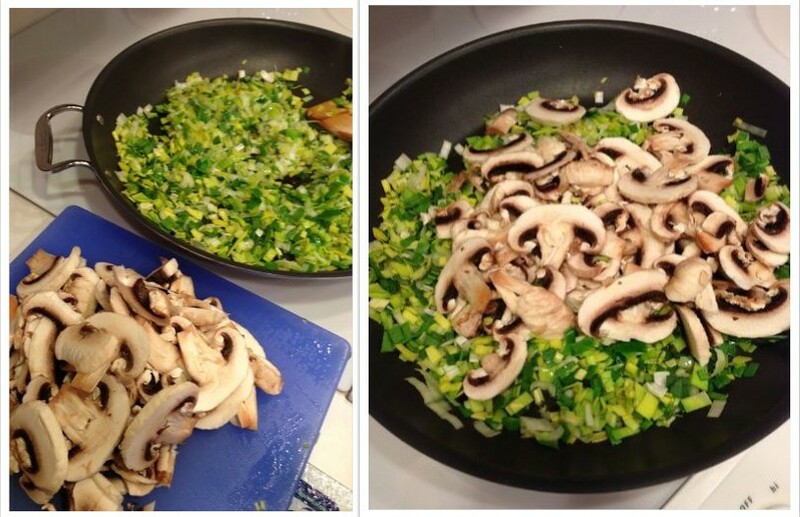 When the green portion becomes a bright green and the white portion starts to lose its color, add the mushrooms. Sprinkle the mixture with the garlic salt, thyme, and ginger. Keep stirring and cooking. When the mushrooms and leeks are almost done being cooked to your liking add the butter. Stir well, so the flavor of the butter gets incorporated into the mix. While the leeks are cooking you can probably start on the dough . . . even before you add the mushrooms to the pan. Combine the flour, cornmeal, baking powder, garlic powder, and basil in a bowl. Stir until ingredients are well mixed. Add olive oil and water mixing until all the ingredients are incorporated and it forms a smooth dough. Form the dough into a ball or a log – something to get you started into the final shape you want. Place the dough onto a piece of parchment paper large enough to fit the pan you are going to bake it on. Then roll out the dough until it’s about 1/4 inch thick in the shape you want. 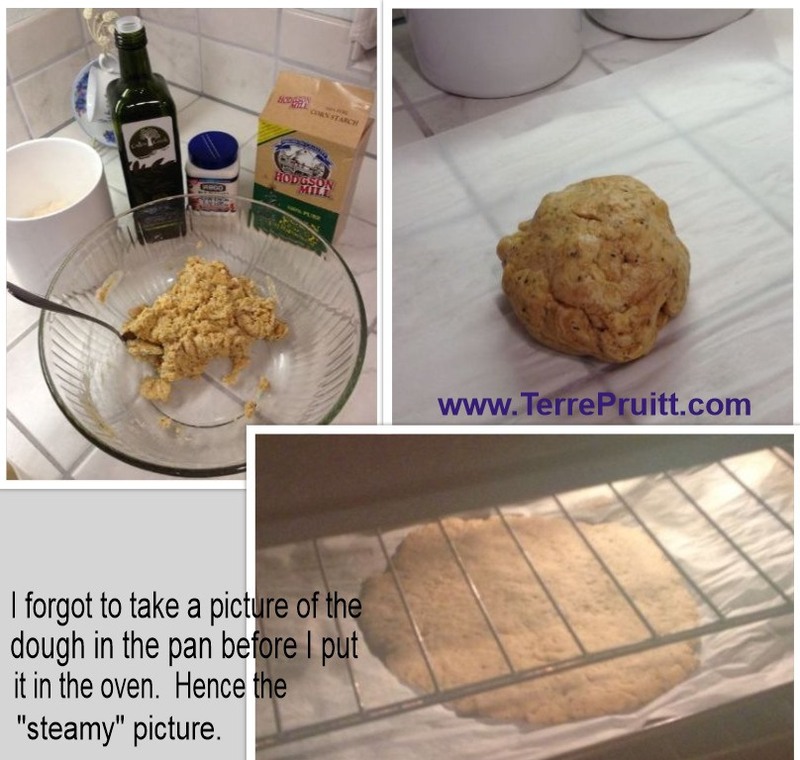 Lift the parchment paper with the dough on it and place it on your baking sheet. Brush or pat a little bit of olive oil on the top of the dough. Bake it in the oven at 400° F for 12 minutes until the top starts to turn brown. Remove the flat-biscuit-shortbread and top with three table spoons of ricotta cheese and a sprinkle of salt. Then place back in the oven for three minutes. 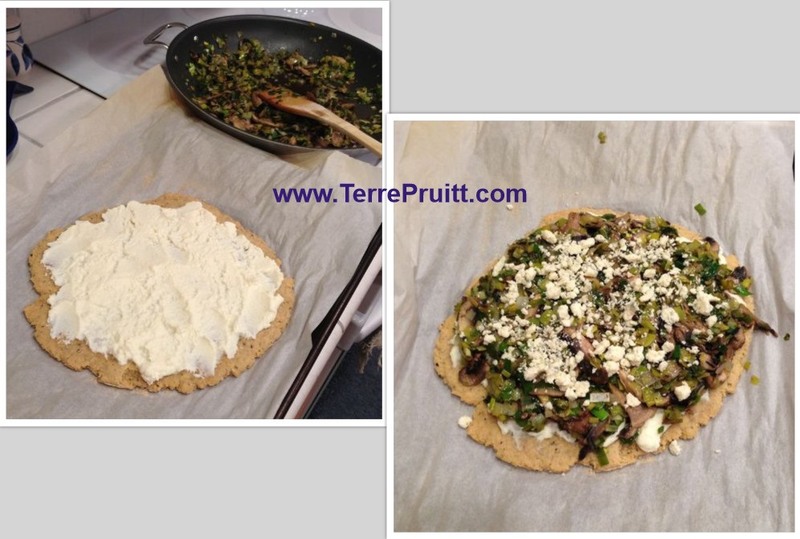 Spread the cooked leek mushroom mixture on top of the crust. Then sprinkle 3 teaspoons of gorgonzola on top of the mixture. Bake for an additional 5 minutes at 350° F.
Cut, sprinkle with pepper (if you want) and serve. My husband and I ate this for dinner one night. It is very rich and quite filling. Do pop over and check out Andrea’s blog and see her recipe of Roasted Maple Butternut Squash Bacon Flatbread which inspired my leek and mushroom topped shorty-bready-biscuit. Are you going to top yours with leeks and mushrooms or something else? According to an article on Shape.com there are 13 ingredients that are banned in “many other developed countries” but are still allowed to be used in food in the United States of America (U.S.). A lot of the ingredients are in foods that are considered highly processed and for many of us these foods can be easily avoided. But some of the things that are allowed in the food in the U.S., but are not allowed in other countries are things that are not listed on the ingredient list when you purchase the product. Two of the ingredients that are banned according to the list are Synthetic hormones (rBGH and rBST) and Arsenic. I am pretty confident that if you looked at a food product that listed arsenic as one of its ingredients you would not purchase it. But when it is not listed, but still could be present in the product that becomes very confusing and a health concern. 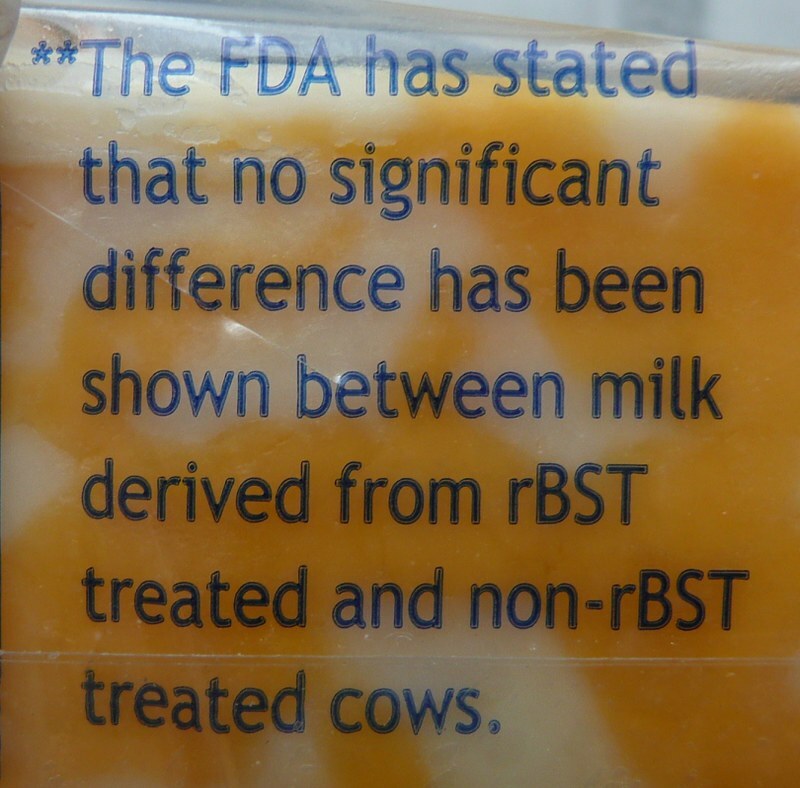 The Synthetic hormones (rBGH and rBST) is not listed on the ingredient list of dairy products. The hormone is something that is injected into the cows to ensure they produce more milk than they naturally could and should. This hormone is something that was created in a lab making it genetically engineered. Because this hormone causes the cow to produce more than is natural the cows often end up with infections of their udders. When they end up with infections in the udders they have to be given antibiotics. You might have heard the theory about the more we use antibiotics, the more the things we use them against grow to be resistant. So we keep having to have stronger antibiotics. Also you might be interested to know that some milk has been documented as having pus from the infected udders in it. Just a few things to think about when purchasing milk. Again, this is because of the hormone that is put into cows and is BANNED in some other countries, but allowed here in the United States. And the arsenic I mentioned, according to the Shape article, is allowed in the chicken feed. It sounds as if it is just for coloring of their flesh. Which goes back to the first ingredient on the list in the article. The artificial coloring. Seems we want our food to be a certain color when we eat it. I remember hearing about an experiment where people were fed a nice turkey dinner in a dimly lit room. They were enjoying the food. Then once the lights were turned on and they saw that all of the food was green some people actually got ill. The food was not green because it was bad, it was just green because it had been dyed green, but because it did not have “normal” coloring some people got ill. So it seems as if consumers prefer food that is pretty, even though some research is showing that dyes are not healthy. Some studies even report that dyes cause health issues. Please keep in mind this is not a complete list of foods that these ingredients are found in. So if you are interesting in avoiding the ingredients check the labels of the food you purchase. And check out the article, it states reasons as to WHY the food manufacturers use the ingredient. Right now my avoid list consists of high fructose corn syrup (HFCS), partially hydrogenated oils/trans fat, and Canola oil. In actuality Olestra too, but I haven’t seen that on an ingredient list in so long I don’t think of it as being on my avoid list. But I am going to be on the look out for the items on this list. I have recently been avoiding the dairy hormones, but I will have to work on the rest. So, what do you think? Do you think you could eliminate some of these ingredients from your diet? Do you want to?